Happy Friday, everyone! It might seem too soon to talk about holidays, but I’m trying to get my shopping done early this year so I’m not scrambling mid-December to get last minute gifts. You might remember me posting about eos in the past, and today I’m excited to share with you of my favorite product of theirs that is probably one of yours too! I love the EOS lip balms! I love that they are impossible to lose due to their shape – I’m always misplacing my other chapsticks. Your tree is so cute by the way! EOS is such a great brand. Next week I begin my holiday gift giving posts. Looking forward to sharing some amazing retailers. I love Eos lip balm. They seriously work for those chapped lips and they are so cute! Oh not at all….never too soon to talk about the holidays! We’re putting our tree up this weekend! :) And definitely on the eos. I would love some of that in my stocking. I started using it last year and won’t use any other kind of lip balm now. I love it! I love EOS too! I always put EOS on my lips before I go to bed! Best lip balm ever! I must own 15 hah they are soo good. This makes me so excited to get my Christmas decor up! I’m obsessed with your tree! Need to step my decorating game up. Have a great weekend! I love eos lip balms! I used them for so long, then for some reason, I stopped buying them. I need to pick some up, especially in their new black swirl packing, I love it; they definitely make for great stocking stuffers! Thanks for sharing, beauty, and I hope you have a great weekend ahead! PS: I love that sweater! Lovely! Can’t wait to see your Christmas decor! Love these..and they’re such a great gift idea!!! I really do love EOS lip balms, and have been using them for years. They are great to have stashed around the house, as I find them too bulky for my bags! Gorgeous photos! 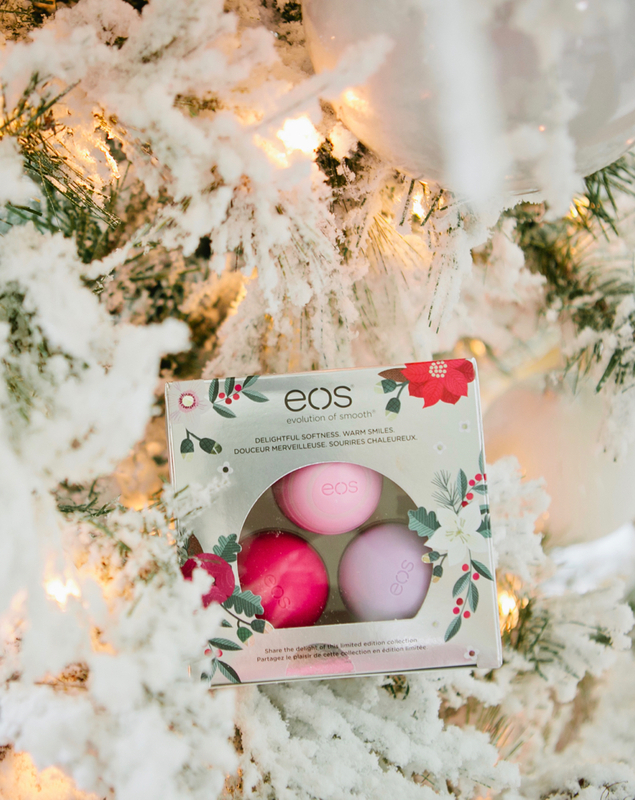 I love EOS lip balms, especially the mint one around this time of year! To be honest, I was a bit disapponted by this product. I don’t say it is not good but I expected more. so excited to see your holiday decor!! its going to look like like a winter wonderland in your house!! I love those eos balls! The peppermint one is my absolute fave! It’s never too soon to talk about holiday shopping. I started in July so I wouldn’t have my newborn and 18 month old in the stores when it’s crazy. Eos lip balms are so cute. I love using them as a stocking stuffer!! I’ve looked everywhere to enter your contest?? Nothing in your Bio..Am i missing something? EOS are my go to chapstick! 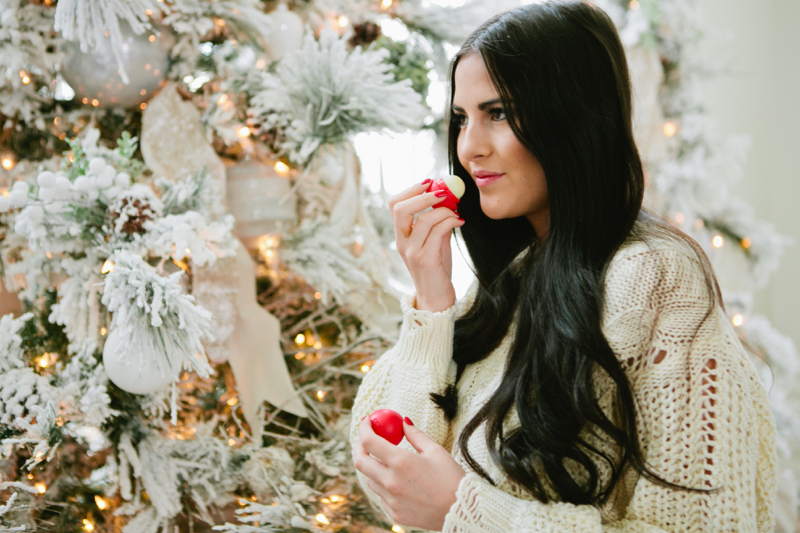 LOVE the red EOS lip balm!! ? Aw, I forgot all about those lip balms! I used to love using those. Their unique shape made em fun, and much harder to lose than the usual tiny chapsticks!! I love eos! I have one sitting on my night stand right now! We love EOS in our house! Such a great stocking stuffer!